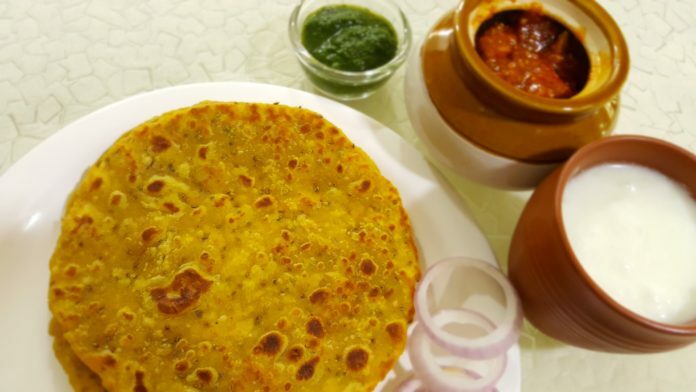 Try this flavourful paratha. You can have it with pickle or curds or black dal or paneer gravy or any chicken gravy. The list is unending. In a deep mixing bowl, combine the wheat flour, ajwain, turmeric powder, chilly powder, oil and salt and knead using enough water to a smooth dough. Make medium sized balls from the dough. Take a medium sized ball and roll into a circle with the rolling pin. Heat a tava and cook the paratha using ghee till golden brown spots appear on both the sides of the paratha. Serve hot with pickle and curds. Vanita's Corner is about simple food recipes and gardening ideas. Turn to this blog to add variety to your everyday cooking and to try your hand at gardening. © All content on this website is owned by Vanita's Corner. All Rights Reserved.